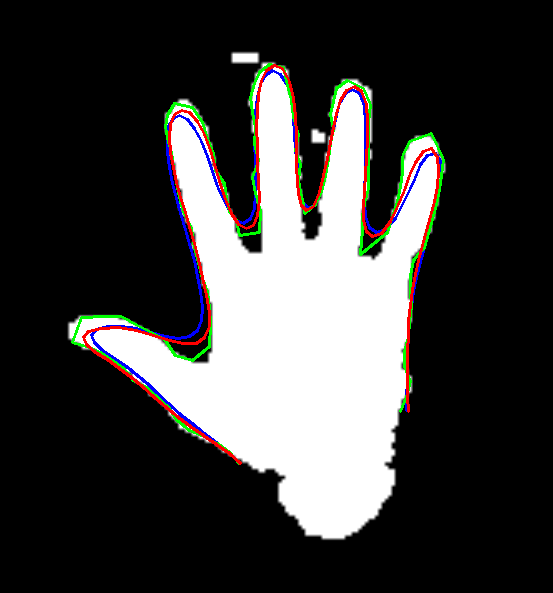 In the last implementation of the hand tracker the particles were re-sampled in every iteration. Resampling means that after evaluating the fitness for each hypothesized particle to the measurement an implicit distribution function is created, and from that distribution new particles are drawn. This is a necessary operation as we get more particles in the areas where the distribution is strong, and thus better tracking. But, we can choose to let particles linger a bit longer before getting new ones, which will save us some time on each frame. This is done by calculating the number of "effective particles", which are the particles that are believed to contribute to the distribution. What this does is give us a measure of how good our current particles are in describing the implicit distribution function. So in our update function we can choose to resample on a given threshold (I'm using 25% of the number of particles, i.e. with 40 particles I threshold at 10 effective particles for a resampling step). After resampling, of course, all particles get an equal score, ready for the next round of evaluation. The original work by Heap & Hogg (paper) indeed includes an Active Contours step within the evaluation of each particle, this means they deform the template curve (from the database) a little so it snaps to the real shape. The active contours method is a very well known and fairly simple curve-tracking method, that is based on marching the curve's vertices in the direction of edges in the image, while advancing in a direction that is perpendicular to the curve itself. However, in this active contour we are using the Hierarchical Point Distribution Model (our shape model) to guide the movement of the snake. The green curve is where the snake wants to go - each point wants to move perpendicular to the curve until it hits an edge. It's very important to start the tracker from a good initial guess, else it has poor chances of working. One thing we can do as part of the interaction design is ask the users to place their hands in known position and start tracking from there. Look at the running number on the top-left for the score, once it hits 10.0 it will trigger the tracker and give it the template as the initial guess.